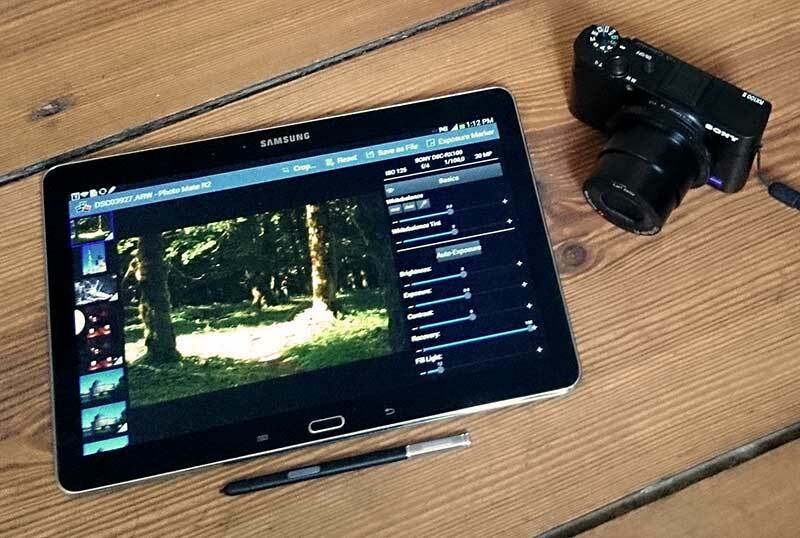 If you want to travel light but still have the ability to shoot and process Raw files the Sony RX100II and Photo Mate R2 installed on a powerful Android tablet, such as the Samsung Galaxy Note 10.1, make a good combination. Ever since the original iPad was launched in 2010 tablets have been the image viewing and presentation device of choice for many photographers. They tend to be sleeker than laptops and on the road provide the additional advantage of smaller dimensions and lower weight. With the right editing apps installed, tablets can be a good alternative to fully-fledged laptops for those who prefer to travel light. However, until fairly recently tablets have not really been an option for those photographers who prefer to capture their images in Raw format. 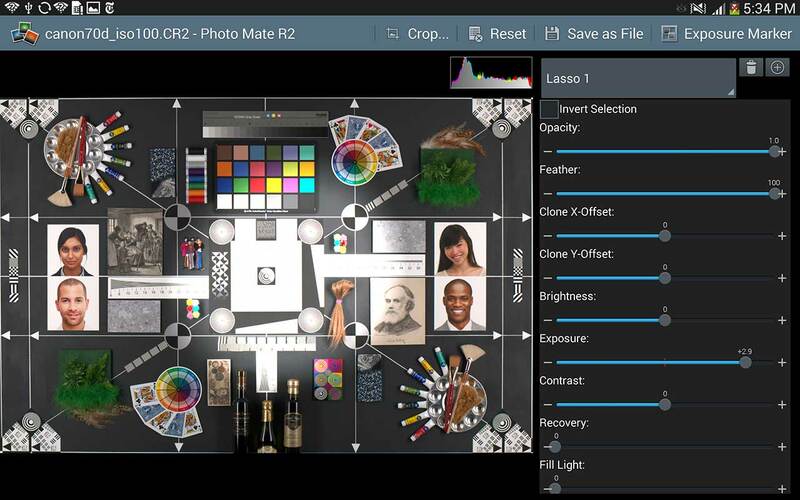 The development of Raw files offers you a lot more flexibility over image-parameters in post-processing than JPEG images but also requires more powerful hardware than early tablets could offer. 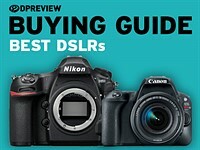 In addition until relatively recently there simply haven't been any apps available that would be able to read Raw files from DSLRs and enthusiast compact cameras. Both these constraints have now been lifted. With its quad-core processors the current generation of Android tablets is capable of dealing with the amount of data found in Raw files and with Photo Mate R2 an Android App is available that can deal with most common Raw formats. 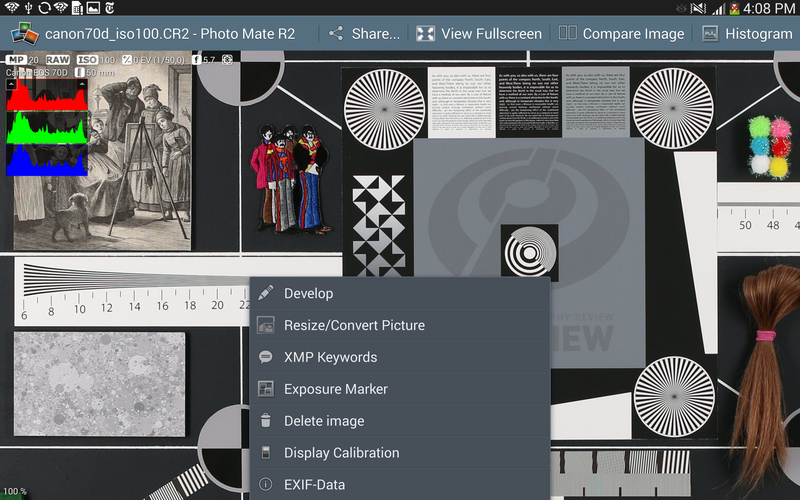 Photo Mate R2 is available for US$9.49 in the Google Play Store. We installed the app on a Samsung Galaxy Note 10.1. 2014 edition and spent some time converting Raw images. Read on to find out how the app works, what it can do and what the end results look like. 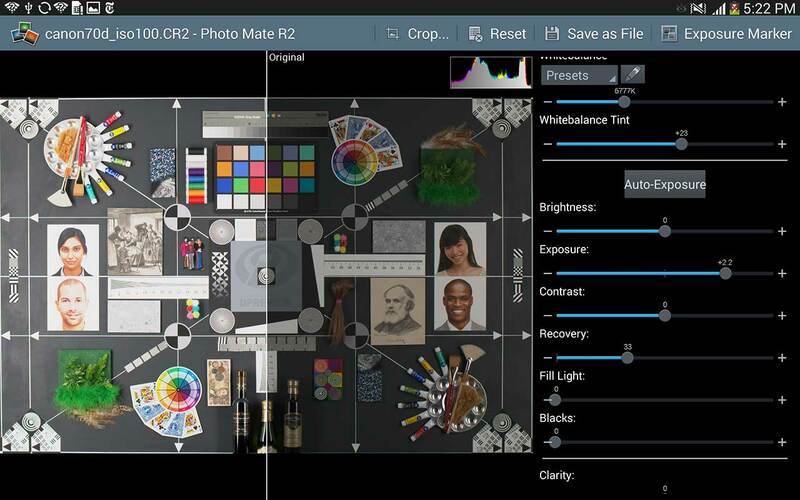 The first step to working with Photo Mate R2 is getting your images and Raw files onto your Android device. The best way of doing that will depend on your tablet. Many models, like the Samsung Galaxy Note 10.1 2014 edition that I've been using for this article, come with a MicroSD card slot, a format that is unfortunately only used by very few cameras. Users of cameras with SD- or Compact Flash cards can purchase adapters to use Micro-SD cards in their cameras though. A MicroSD to SD adapter, like this model from SanDisk, can be a good tool for moving your images onto an Android tablet with a MicroSD slot. If fiddling with minuscule MicroSD-cards is not your thing you can alternatively use a Micro-USB card reader for your Android device or, if you own a "connected" camera, transfer your images in wireless fashion. 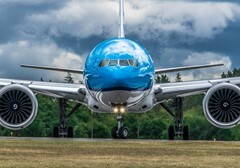 Another way of getting your images onto an Android device is a cloud service such as Dropbox but since you would have to upload them the cloud with a computer first and an Internet connection might not be readily available on the road this kind of defeats the purpose of using a tablet for Raw processing. 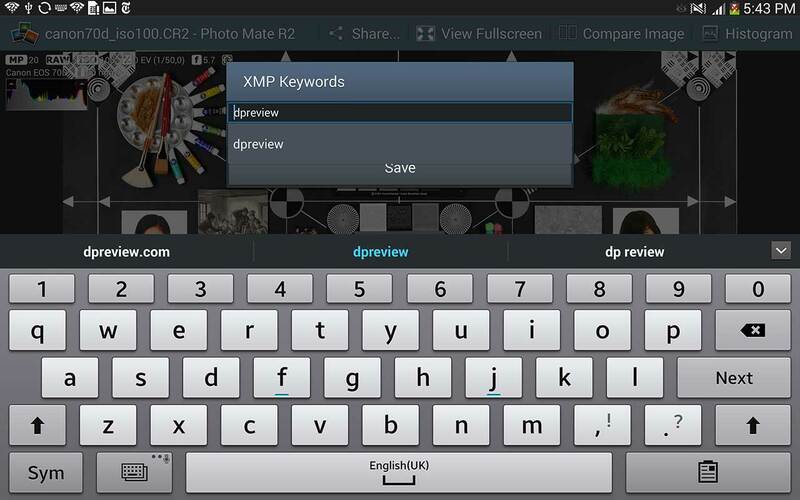 Once your images have been transferred to your Android tablet and you open the app you'll see that Photo Mate R2 has a comprehensive feature set and a user interface that is not too dissimilar to comparable desktop packages. The app opens in file browser mode from where you can start a slide-show, jump straight to development mode or simply open an image. In Quick View mode you can quickly browse through all images in a folder by swiping left and right, just like in most gallery apps. However, this option only displays the embedded low resolution preview JPEGs in a Raw file and is therefore not suitable for critical viewing. 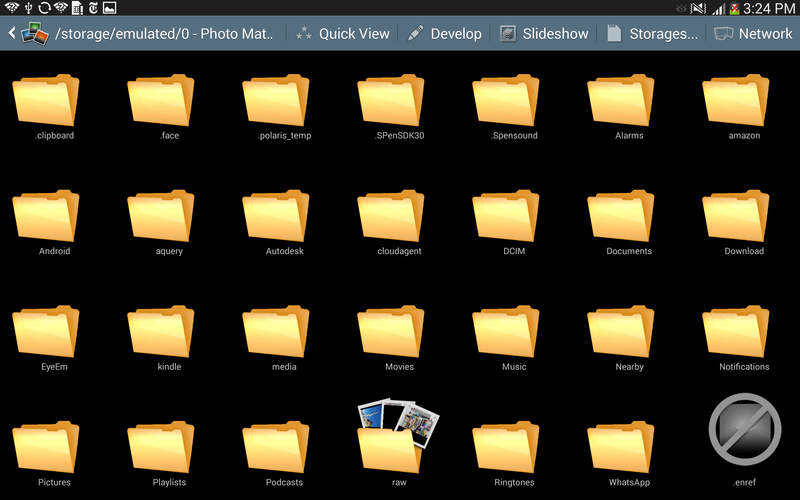 The app launches with the folder view. We've moved all our Raw files into a folder labeled "Raw". 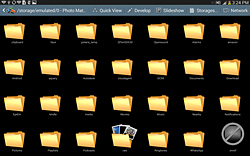 Inside the folder you get a thumbnail view of both Raw and Jpeg files. 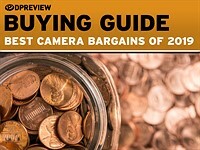 In our case the app struggled with the rendering of the Nikon D800 thumbs though. A tap on the "Open Image" button opens the actual file and allows for viewing of images at 100% and larger magnifications. This works for both Raw and JPEG files. Depending on the file type you are viewing rendering and scrolling can be a little slow. The .ARW files from my Sony RX100II worked perfectly fine for example but the .DNGs from a Pentax K30 were occasionally displayed pixelated. Mostly they worked fine on a second try though. There's also a "Compare Image" mode for side-by-side comparisons of two images but, like Quick View, it only uses embedded low-resolution JPEGs. In image view you can zoom in to 100% magnification and beyond to inspect fine image detail. There are an optional histogram and highlight- and shadow warning. From here you can also access detailed Exif-data and add keywords or jump straight to development mode via the menu. 100% viewing generally works fine and offers a real advantage over the low-resolution preview you get in most standard gallery apps. 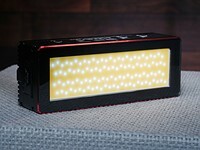 However, Photo Mate R2's unique selling proposition is its development module. You get there either from the browser by hitting the "Develop" button in the top bar or via the menu from image view. In development mode you've got an impressive array of editing features at your disposal, not far off from what you'd find on desktop Raw converters such as Adobe Camera Raw or Capture One. 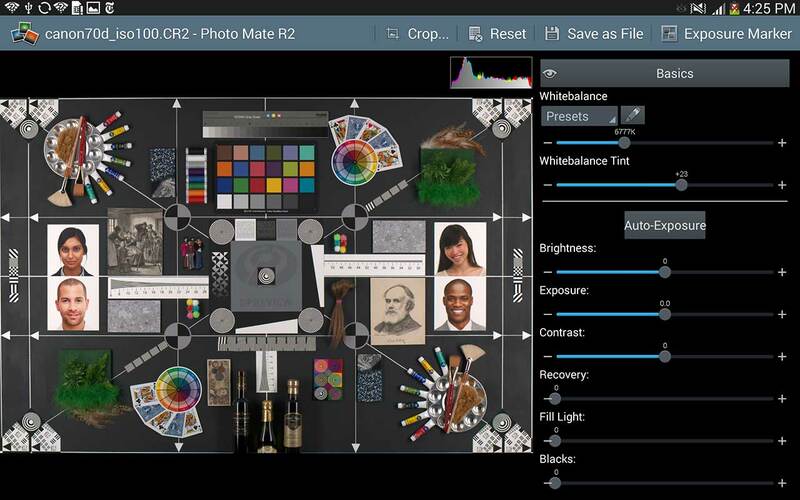 Under the "Basics" tab alone you find options for digital exposure compensation, altering the white balance, adding fill-light, recovering highlights and modifying a range of other image parameters including brightness, contrast, hue and saturation. In the development screen you've got an arsenal of editing tools at your disposal in the tool bar on the right. A click on each category reveals all the available options. 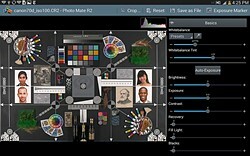 The "Details" tab provides the tools you need to squeeze maximum detail out of your Raw images. 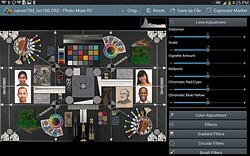 Here you can adjust the sharpening amount and radius and control both luminance and color noise reduction. 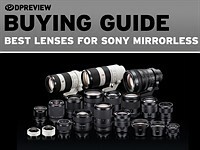 In the lens section you can correct distortion, vignetting and chromatic aberrations among other lens flaws but there are no pre-defined lens profiles available. 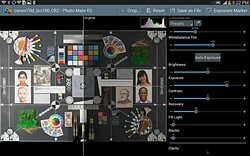 In the Basic section you find exposure parameters such as digital exposure compensation, highlight recovery and shadows. 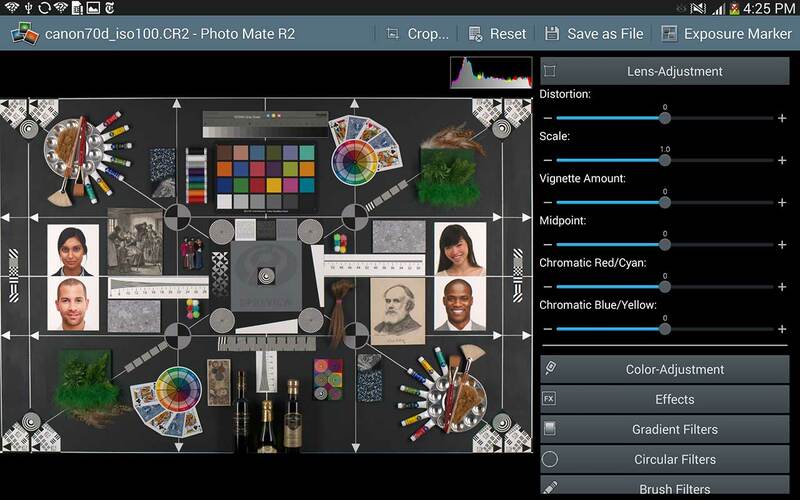 Photo Mate R2 also offers a range of lens correction tools, but there aren't any predefined lens profiles available. For the modification of only selected image areas you have gradient, circular, brush and lasso selection tools at your disposal. You can feather selections and change the opacity which allows for detailed area-specific editing. Personally I feel most comfortable making those type of selections with a mouse or some other type of pointing device rather than my meaty fingers on a tablet but . That said, the Galaxy Note 10.1 comes with a stylus that allows for very precise selections. A split-screen allows before and after viewing of image edits. 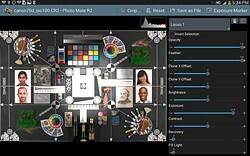 A range of selection tools allows for area-specific editing in an image. 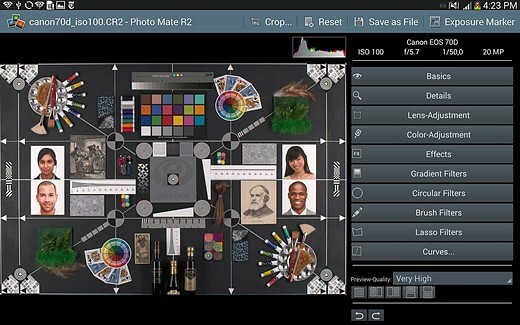 Photo Mate R2 also offers a range of options for batch processing of images. You can convert all images in a folder, select multiple images for processing or filter images for processing by keyword or rating. You can also select more than one image in development mode by "long-tapping" them in the thumbnail row on the left. 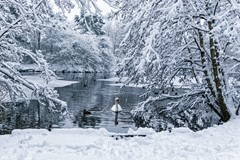 Edits are then applied to all selected images. For color-critical applications there is a display calibration module on board. You can add keywords and star ratings to your images and then use them for filtering. Once all edits have been made, keywords have been added and and star ratings have been applied you can save your image in either JPEG, PNG or TIF formats and choose from a range of quality and size options. You can define file name pre- and suffixes and get the option to include a watermark and delete/keep the Exif-data for your file. 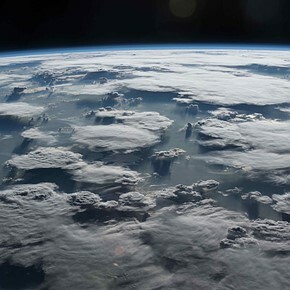 The time for conversion and saving depends on the files and hardware you are using. 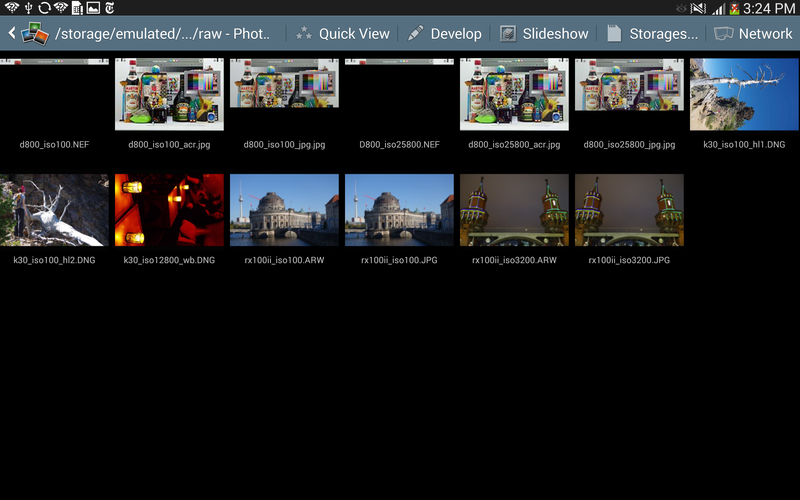 On the Galaxy Note 10.1 it took approximately 25 seconds to convert one of the Sony RX100II's 20MP files. The preview options are a nice touch, too. For previewing of your editing effects you can split the image view vertically or horizontally and see the original portion of the image side-by-side with the edited one. I may have missed it in the article, but can the app handle Sigma X3F RAW files? I Was looking for a Android RAW processor for many months. 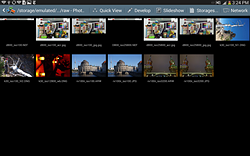 Now I can edit my Sony NEX6 ARWs and Nikon D700 NEFs on my Samsung Galaxy Note 10.1 (N8000) uploading the imagens from SD and CF cards just using a simple Card Reader. Of course, Photo Mate R2 doesn't have the power of Adobe Camera Raw on my Corei7's (Desktop PC and Notebook), but still good enough to recover overexposed and underexposed images, and Fill Light feature is very usefull too. With a simple 3G connection (4G was released after I by Galaxy Note N8000) I can upload the image to facebook fast. I can do this with my Galaxy Note N7000 phone too (import, edit RAW end upload to facebook). I liked a lot. Thank You TS Systems. I love PhotoMate, and the dev is a good guy who hears his fellow photographers pleas for features and bug fixes. I've been out of the Android tablet game since my Nexus 7 went into a coma last year. I forgot how much I utilized PhotoMate, and now I realize I NEED to revive the N7. Sorry reading the reviews and the dev is actually not that friendly a person, well based on his often snappish comments on reviews. Dude needs a bucket of xanax. Still it's a dandy app I've been using now and then for a while now. Of course he did the EOL on PhotoMate (original) creating a new version we all had to buy rather than upgrade or free to existing customers. 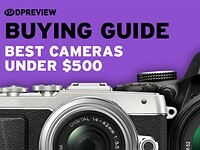 First version did not have the RAW converter built-in/included and you had to buy it. None is huge and just growing pains but it's funny to watch happen and wonder when the dev is going to grind this app into the dirt then just sell it off. Hope he doesn't but does keep moving in the positive direction. V2 is AMAZING even if it sounds like I'm being negative. I like it a bunch. High learning curve though, well as Android apps go anyway. Ya have to watch the tutorial vids to get what it's all about. Can you add EXIF data? Try digiKam what is available for Windows and OS X too. It gives you full control of photolibrary like no other software and full control of metadata even in specific profiles or batches. Editor is OK with very nice features but tools and work flow is little time consuming. IMO, a tablet is useful for checking shots while in the field but for proper processing, most sensible people will want to wait until they get home, then do the processing proper on their PCs or MACs. Moreover, like me with a Nexus 7 and limited storage with no micro slot, they may not want to clutter up tablet space with large RAW files. In those circumstances, Nexus Media Importer is ideal because you can look at the embedded JPEGs from the RAW files without downloading anything onto your tablet. If you do not have the ability to judge your images from a JPEG preview and what is possible once you get to work on the RAW images proper, then I hasten to add that your skills and experience may not be up to using RAW to good effect anyway. That is especially so if you bracketed exposures as many RAW users do. Who wants RAW on their tablet except for a preview? It makes little sense to invest in a quality camera only to limit the standard of the output by modifying images on a tablet. There are Android tablets other than the Nexus 7. Many of these tablets have card slots. Over time Android tablets will get faster. 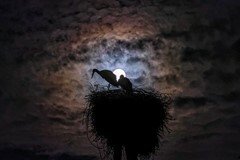 "then I hasten to add that your skills and experience may not be up to using RAW to good effect anyway. 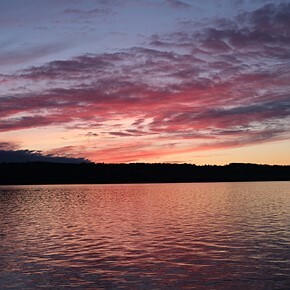 That is especially so if you bracketed exposures as many RAW users do." Huh, bracketing? No all raw shooters are shooting like that, static images. "It makes little sense to invest in a quality camera only to limit the standard of the output by modifying images on a tablet." In not real news, even the "retina" display on new Macbooks isn't a particularly good screen, so by your logic you'd not use a Macbook for raw extraction either. let's be real. 1/2 a minute convrsions saving out is just not practical. do this on proper win8 x86 hardware tablet and it's literally a 2 second conversion. 25 seconds waiting on an image is just a huge waste of time and only really usable in absolute dire circumstances. if i'm out in the field, i will have an x86 tablet. we are just not there yet by any stretch on any other hardware. But let's imagine a faster Android tablet in say 2016. I convert my images on an Intel i5 laptop and usually go away and make myself a tea while I wait for the images to be processed. If you process an entire batch it's always gonna take some time. To some people a few seconds more or less might matter, to many, I am sure, it doesn't. Thanks for this. With very fast desktops I forgot about batch processing in the background. Yeah, this is also acceptable indeed when travelling. So instead of bringing a tablet during the shoot and a laptop for processing in the evening, this will actually work in terms of processing speed. I would not mind if the little guy need hours to churn out the finished JPGs for uploading. @tsgames, currently i use an i5 iconia tablet. it is fast, helped along by the speedy ssd. i pop my raw file through, apply my adjustment, then save it out. that whole process takes however long i need to get the right setting for the shot. saving it out literally takes two seconds. if i apply a preset, the whole process takes about four seconds from opening file, applying preset, saving it out. 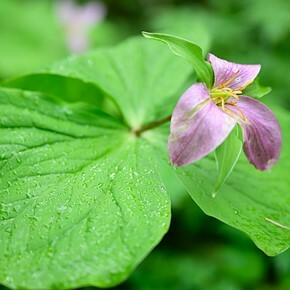 I don't believe tablets can be used for fine-tuning raw images on the go. I personally find processing images on my 13" laptop in a hotel room using Lightroom or Photoshop extremely trying. Screen reflections, washed-out colours and severe eyestrain all make it a nightmare. I have a 27" monitor at home but I would still like something bigger - like the 40" Lenovo IPS monitor for about 700 Euros. I think this app should not be seen as a substitute to a desktop solution but an additional tool at your disposal. IMHO, this is stretching the envelope of usefulness of tablets. It is "trying too hard" to fit a 10lb brick in a 5lb basket. For RAW editing anyone would be way better off with an Ultralight laptop (like Macbook Air) or Windows tablet (like Microsoft Surface.) Heck, you can buy last year's Surface Pro for $600 with an i5 processor and 128Gb SSD. Better still the Surface has true Wacom digitizer support. It's nice to see someone trying to develop decent raw extraction software for the Android system. I think the bigger problem is thinking that touch screens can easily replace all the features of a computer mouse. I agree why would I want to edit raw images on a tablet and to what end. Its just not the right tool. Maybe in four or five years the processors will be up to speed but the raw files will be 4-5 years more complex as well. Maybe good incase of emergency. 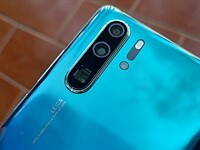 Considering that camera processors can turn raw into jpg, it shouldn't be a surprise that a tablet processor can do it, indeed it should be able to provide some extras. The small screens aren't the best editing environment. And I think storage space is currently the main issue with tablets. 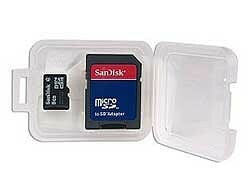 Even with USB OTG or Eye-fi, you're still stuck with tablet flash card, plus one microSD, optionally. Not remotely suitable as the regular raw converting device, and for storing batches of images. 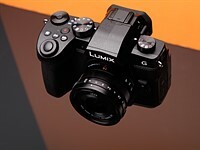 I can imagine it as a viewing device for jpgs (shooting raw+jpg), and occasionally checking if a harsh-lit scene is recoverable using such a raw converter. A tablet could be used to make backups on the go, for instance from USB OTG to spare microSDs. But once I did try a similar operation, and it wasn't as convenient as it may sound at first glance. As for ultraportables, they're not so much better, the main difference is that they contain a SSD disk rather than cards. I prefer a regular laptop. It all depends on what you're trying to do. I don't see this as replacing a "real" computer with a full RAW processor/editor. I see this as a tool to have a look at your chosen images in the field and then adjust them to see if you have what you need. Maybe you You've taken 200 shots and you scan through them and pick your best ten to work on with this App on your tablet. Then, when you get back, you copy over the sidecar files from those images and the RAW files and do final tweaking on your desktop/laptop with Lightroom. But this is speculation on my part, as I haven't tried it yet. Tablets have one advantage, they can be charged with light solar panel. For any ultralight laptop solar panel is much heavier. 25 seconds to open a RAW file even on a Snapdragon 800? Ouch. 25 seconds to convert; not to open a RAW file. And that's a 20mp file. A little slow, but it's a little slow in LR on a fast computer. If you just preview the file it's somewhat less than a second on the latest mobile hardware. 25 seconds to convert a 20MP image is not too bad, and if you have a work flow plan, you can set the tablet to convert in the background. First, as others have said, don't forget OTG. I've been using an OTG adapter cable to connect a card reader (CF or SD) to Android devices or years and then copying over RAW files and using "CR2Thumbnailer" to view the RAW images and export JPGs. But that App doesn't give options for improving the image, so the extra features of this new APP look good. However, one key question: does it generate Lightroom-compatible sidecar files with the edit information so that I can transfer the RAW file and its sidecar file to my PC and view/improve the changes there? OK, if at least some will transfer, including ratings, that could be useful. This would allow for quick basic processing on the tablet (enough to get a good idea of the image), plus adding tags for the location, etc., and then the detailed work could be done in Lightroom once the files are copied to a PC. RAW processing on my phone/tablet for a single payment of $9? vs $99 per year to rent similar software from Adobe? Just to play devil's advocate: There is such a thing as bad raw extraction software, even stuff you have to pay for on a Mac or PC, see for example Silkypix. But right, all other things being equal: Adobe is being preposterous and belying the claims about LR remaining as a perpetual license. A bit early to make that judgement on an unreleased product. I have been using Photo Mate R2 for a few months now. Surprised the reviewer makes no mention of Eye-Fi cards, which I use daily and which transfer Raw files to my Nexus 7 very quickly. Before using Photo Mate R2 I usually copy the files from my eye-fi folder to a new folder specific to the shoot for easier file handling. Then working my files is fast and easy. 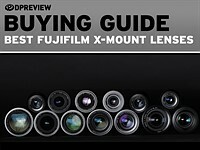 I highly recommend the App and the Eye-fi card. For deadline field work and personal shooting it is great. For any other end use I go on my Laptop and my 'PC' workflow. "However, until fairly recently tablets have not really been an option for those photographers who prefer to capture their images in Raw format." From the introduction of the original iPad, iPads have had raw processing built in. The article you've linked describes how you can view , but not edit and process, Raw files on the iPad. For this the iPad almost certainly displays the JPEG that is normally embedded into all raw files for exactly that purpose. 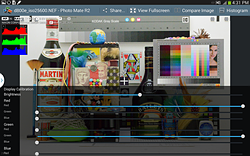 Photo Mate displays and lets you edit and process the actual Raw file which is a totally different kettle of fish. Maybe interesting if you absolutely must do some RAW processing on the go, but apart from that ... doesn't make sense with current tablet technology and I don't see that changing soon. Tablets are viewing, browsing, presentation, communication devices. 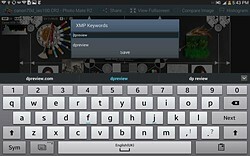 I'd rather see software that can quickly find suitable images among all images that are present on the device, based on a few keywords, and present them to the viewer. The only way to do that now AFAIK is to have a website with all your images and indexing software, and access that through internet. Not very attractive for several reasons ... Or use a Win 8.1 tablet with full Lightroom (gets expensive ...). Maybe Adobe will make something like that with the new Lightroom mobile? Thank you for this review. I am more interested in what Library Photo Editing function this application has. E.g. can you compare two images side by side and pick a candidate, then keep the candidate and compare to the next image in the series and then keep doing it until you have found the best image of a series of same images? This part seems to be missing. I would use such an app when travelling. 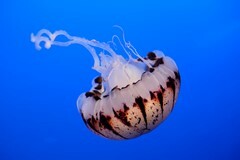 I would ingest the shooting of the day and then edit down the keeper and delete the images that did not made the cut. RAW editing I would do later in Lightroom on my Desktop. Posts from anybody who knows the answer to this app or who uses another app with this workflow are highly appreciated! You have side-by-side comparision and while you do comparision, you can rate or label the candidates. This should help you find the best image later one. You can switch any of the images, so you can always "keep" the best image as a reference. IPTC? Without IPTC captioning the program is of little use to pros. Does it have it or not? Please to those who review high end photo apps please let us know if IPTC is a program feature. A discussion on how to get RAW files unto an Android device (particularly without a PC) would also be prudent, not everyone's aware of USB OTG and even fewer are aware of how flexible it is: you can go direct from camera to mobile device, card reader to mobile device, and there's keychain sized even micro USB OTG microSD readers... Some devices (like the Nexus line) might require a extra app like Nexus Media Importer etc to mount the card/camera. Wifi would absolutely not work for this since I'm not available of any app that imports RAW over ad-hoc wifi connections to cameras, I'm sure it'll happen eventually tho. if you use an Eye-Fi card you can tell it to copy the RAW files over Wifi to your device of choice, Android and iOS or Windows and so on. Easy to get the files across like this but easiest is a USB OTG cable as its faster and more convenient. Good review though and I am glad this great app has been reviewed so ore people know about it. have been using it for ages while travelling with my Nexus 7 and it works great. Now I wish there would be one like this in the Windows 8 store to use with touch screen only instead of having to use the Desktop for everything. Nexus Media Importer is not required, if all you need is to transfer images. In fact you can use one of many OTG apps to access or import USB media. I use StickMount which is free, but requires root (as do some of the other OTG apps). Nexus Media Importer ( not free) does not. Didn't know Eyefi could actually backup RAW; that's neat, tho as you alluded to, USB is definitely gonna be faster... At least until we get 802.11AC speeds out of very small embedded wifi solutions. At some point the flash media becomes the bottleneck either way. I suggested Nexus Media Importer because I was somewhat familiar with it, didn't even remember it's a paid app... All my devices are rooted and they're all Nexus right now so I just use Stickmount as well, on recent HTC/Samsung phones you don't even need an extra app, external media mounts on it's own and off you go with any file explorer, etc. I had a look at Raw vision before I started writing about Photo Mate but as its name implies you can currently only view but not edit raw files. Ah, at the time I glossed a bit over the details and probably assumed that if both could export JPEGs they both must've had basic editing. I still wouldn't mind an in depth look at to see if it does RAW navigating/viewing any better thanPhoto Mate (like actual side by sides not using the preview JPEG etc). Thanks for this article btw! Not sure I said it earlier. I have and use this program on my Nexus 7 all the time- it is the one truely killer-app for me. Not that the results are necessarily perfect, but it does give me a good feel for just how much headroom I will have to work with on DXO later on when I get back home (I go on pretty long trips and don't bring a full-sized laptop). Ever heard of Photogene on the iPad? There are at least two other RAW converters for the iPad. "Photo Mate R2 is the only fully-fledged Raw converter for Android we are currently aware of." Do iPads have card slots, do iPads have micro USB ports? Yes, they do have a card slot should you choose to purchase it as well as a USB port. Besides, I don't think the OP was trying to start an Android vs. iOS battle. Then I suggest you read some of the B+H reviews of the SD card reader that can be plugged into iOS devices. Why bring up an iPad? There's no iOS version of this software. So yeah the OP wanted to called attention to something ostensibly better with an iPad. Please, whoever is in charge, delete my posts here. I always regret saying anything to people who are always more right. No matter what one says there is always another level of detail that makes someone else more right. I don't want to play this game. I totally dig my SD card reader for my iPad, by the way. Works like a charm. The number of bad reviews had put me off the iSD gear. The point remains that the iPad doesn’t really have a USB port. And that indeed the OP clearly raised a point about the iPad on a comments forum about an Android device running Android only raw extraction software, also the only Android raw extraction software. Not one of those points is really another level of detail. Apple’s choice to limit the functionality of the iPad is both a strength (can’t go down too many rabbit holes) and a weakness (eg clearing Safari’s cache + browsing history is convoluted). The way to dealing with RAW files on Photo Mate would be a USB OTG cable, either micro USB at both ends for direct camera connections or micro to female full size for plugging in an SD reader etc. I've no clue how well the card reader for iOS devices works, I'm sure there's some additional limitations but as long as an app can get access to the RAW files they should be no less capable. Well I'm pretty sure that the Samsung Galaxy NX can move raws over wifi via software like DropBox and likely NFC too. But I know that's an outlier and has other drawbacks. The earlier version of this application was called PhotoMatePro and it worked on my Galaxy Note II despite it being designed for tablets. Once last thing. Images can be quickly imported directly from most modern cameras using a simple (and very cheap) OTG usb cable. 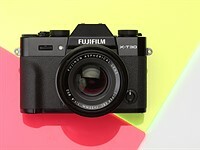 After connecting my Fujifilm x100s and powering up, jpegs can be viewed directly in the stock gallery application and imported with a simple click. Raw files will be opened in PhotoMatePro. Finally PhotoMatePro and I assume this app are great for improving jpegs. thanks, the OTG cable is good advice...I did not know that's an option. So you open the files from the camera and also save the converted versions on the camera's memory card? Either or, once the camera (via a micro to micro OTG cable, less common but still cheap) or the card (via a micro to full female cable + reader) is connected to the tablet/phone, it's just another storage location... Just like internal storage or a micro card inserted into the tablet. It would be completely up to the app (and yourself) where exported or edited files are saved and whether you'd copy the files over previous to working on them. The latter would probably make sense because even tough mobile device NAND controllers aren't all that fast, they're getting faster every year and will eventually obliterate a card's own controller when it comes to random access of smaller file blocks (edits, loading individual files, etc). We're already seeing news of mobile devices moving on from eMMC controllers (similar to what's on removable media) to UFS 2.0 which should greatly help matters (Qualcomm & Toshiba will apparently be mass producing them this year). Currently this is probably as much of a bottleneck as raw processing power on the CPU's part. Meh, i will stick with my laptop PC thanks; tablets are best left for media consumption or gaming. I also dont need to have the NSA snooping on my photos via the backdoors that Google built into Android. Unlike the backdoors in Windows/OSX/Linux?